"Over the past quarter, our Virtuous Cycle, driven by our"
Supporting schedules and selected balances are either attached or located at: https://www.aboutschwab.com/financial-reports . *Disclaimer: From FORTUNE Magazine, February 2019, ©2019 Fortune Media IP Limited. FORTUNE and The World’s Most Admired Companies are registered trademarks of Fortune Media IP Limited and are used under license. FORTUNE and Fortune Media IP Limited are not affiliated with, and do not endorse the products or services of, Charles Schwab. From Investor’s Business Daily, January 28, 2019, ©2019 Investor’s Business Daily, Inc. All rights reserved. Used by permission and protected by the Copyright Laws of the United States. The printing, copying, redistribution or retransmission of this Content without express written permission is prohibited. 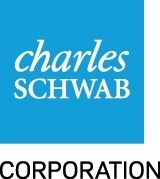 Charles Schwab received the highest numerical score in the DIY segment of the J.D. Power 2019 Self-Directed Investor Satisfaction Study of investors’ satisfaction who use self-directed investment firms. Visit https://jdpower.com/awards . Periodically, our Chief Financial Officer provides insight and commentary regarding Schwab’s financial picture at: https://www.aboutschwab.com/cfo-commentary . The most recent commentary, which provides perspective on crossing the $250 billion consolidated asset threshold for heightened regulatory requirements, was posted on August 14, 2018. Important factors that may cause such differences include, but are not limited to, general market conditions, including the level of interest rates, equity valuations, and trading activity; the company’s ability to attract and retain clients and registered investment advisors and grow those relationships and client assets; competitive pressures on pricing, including deposit rates; the company’s ability to develop and launch new products, services, infrastructure and capabilities in a timely and successful manner; client use of the company’s advisory solutions and other products and services; the company’s ability to manage expenses; client sensitivity to interest rates; capital and liquidity needs and management; and other factors set forth in the company’s most recent report on Form 10-K. 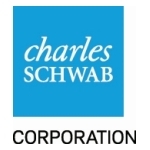 The Charles Schwab Corporation (NYSE: SCHW) is a leading provider of financial services, with more than 360 offices and 11.8 million active brokerage accounts, 1.7 million corporate retirement plan participants, 1.3 million banking accounts, and $3.59 trillion in client assets as of March 31, 2019. Through its operating subsidiaries, the company provides a full range of wealth management, securities brokerage, banking, asset management, custody, and financial advisory services to individual investors and independent investment advisors. Its broker-dealer subsidiary, Charles Schwab & Co., Inc. (member SIPC, https://www.sipc.org ), and affiliates offer a complete range of investment services and products including an extensive selection of mutual funds; financial planning and investment advice; retirement plan and equity compensation plan services; referrals to independent fee-based investment advisors; and custodial, operational and trading support for independent, fee-based investment advisors through Schwab Advisor Services. Its banking subsidiary, Charles Schwab Bank (member FDIC and an Equal Housing Lender), provides banking and lending services and products. More information is available at https://www.schwab.com and https://www.aboutschwab.com . (3) Advice solutions include managed portfolios, specialized strategies, and customized investment advice such as Schwab Private ClientTM, Schwab Managed PortfoliosTM, Managed Account Select®, Schwab Advisor Network®, Windhaven® Strategies, ThomasPartners® Strategies, Schwab Index Advantage® advised retirement plan balances, Schwab Intelligent Portfolios®, Institutional Intelligent Portfolios®, and Schwab Intelligent Portfolios PremiumTM; as well as legacy non-fee advice solutions including Schwab Advisor Source and certain retirement plan balances. Average client assets for advice solutions may also include the asset balances contained in the mutual fund and/or ETF categories listed above. For the total end of period view, please see the Monthly Activity Report. 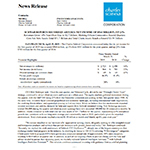 (6) Schwab One®, certain cash equivalents, bank deposits, and money market fund balances as a percentage of total client assets. 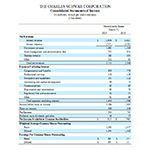 (9) Represents average total interest-earning assets on the company’s balance sheet.